Inspired by Beth and with thoughts to Heather, I am submitting a poem I wrote that was rejected by the New Yorker. Wait - the rejection isn't what made me think of Beth here rather it is the poetry of her postings. And to my dear sister Heather, if you read this blog anymore, I love you and hope news is better soon. Heather is a wonderful poet and she didn't reject my poetry like the New Yorker did rather encouraged me to submit it as perhaps this is the kind of tripe they publish. OK - she didn't say that but I thought it. 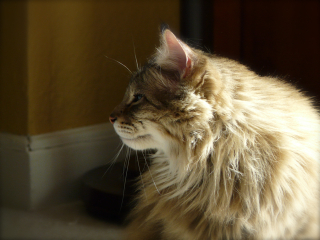 The picture is Toulouse on Easter morning, doing what he does best - looking beautiful. 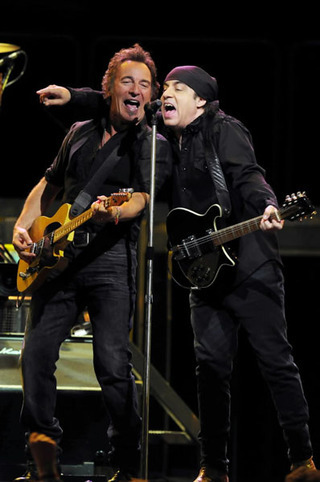 I suppose there are many things I could say about the Milwaukee St Patrick's Day Bruce Springsteen concert. I could talk about the set list. I could talk about how much older everyone appears. I could detail everything Bruce said - how he remembered the history of where he was playing ("Are you loose?"). I could talk about his politics. But, you've all been too kind to mention how poor I am at reviews. Plus, there are really nice reviews out there already. I guess what I want to mention is how the concert made me feel. Bruce Springsteen's music in general is so uplifting and I always feel happier listening to it. To give you an example, take a look at the lyrics for Lonesome Day or my all-time favorite, Badlands. Those songs really helped me through the struggles we had after our nation suffered on 9/11/01 and my own family struggled through two miscarriages and the devastating diagnosis of Aidan's heart defect while I was pregnant and the subsequent 4 heart surgeries. While at Monday's concert, I felt so good inside. I was able to catch up with my good friend, Scott, and his wife Kathy and also have Jeff at my side. I started thinking about the concerts I've been to from the first E Street concert in the late 90's that I ever attended with Jeff while we were still dating. Bad acoustics, worse seats, but still exciting! Then there was the first leg of The Rising tour. I went with Scott in September of '02 and it also happened to be the day Aidan was conceived. I guess that is probably too much information in itself and no, Scott's not the dad. After two miscarriages and fertility drugs, I was very precise in what I knew about what was going on... Let's just say I had to leave work early and meet Jeff at home before going to the concert. Anyway, I attended that concert full of hope and I was not disappointed. We were very close to the stage though high up. We were able to see a lot of the stage interactions. It was a great concert. The following year, I had given birth to Aidan and we had made it through the first two heart surgeries. Scott and I attended the second leg of The Rising tour at a different venue. I remember being so happy to be out of the house and that the concert was a year to the day (or close) from the previous concert. I was breastfeeding and I know as the night went on it was tougher and tougher to dance. I loved being a new mom and rarely got out so this was a very happy time. In 2006, Aidan had his 4th heart surgery and it was open-heart. Our family was under a lot of stress due to this and other circumstances. I didn't feel the relief I thought I would after Aidan surgery was over in May and he was alright. They were grim times for us. One of the lights of that year was going the month following Aidan's surgery to see Bruce perform with the Seeger Sessions Band. Not only was the music fantastic but the musicians (20+) were so talented. It was just plain fun and, of course, uplifting. Jeff turned to me after the first song and said it was the best song he had ever heard. He was so right. I will never forget that concert and must say it was the best one I've ever been to. Jeff and I don't get out often. We can't afford it and don't have a babysitter outside of my mom or my sister, Heather. So going out in general is extra special. And Monday's concert was no different. I was able to reflect on all we have been through and how much better our life is now. How happy I was to be there. How hopeful I am of the future. How much better of a person I want to be. Thanks Bruce. So this is a real personal rambling and If you've made it this far, all I have to say is "Thanks, Mom!" Unlike my car trash bag, I am kind of tickled at my sunglasses holder. It is lined with lens cleaning cloth and the outside is home dec fabric. These sandwich medium-weight interfacing. A little bias trim 2/3 down encloses the opening, which is the perfect spot to pull your sunglasses out from. I made one for Aidan, too in Lightning McQueen fabric. He was very excited. Since his sunglasses were smaller, I shortened the length by 1”. I plan on making more of these – if anyone is interested in a tutorial, please let me know. One of my favorite blogs to read is Junie Moon’s. June is so creative on a daily basis and very giving with her ideas and tutorials. 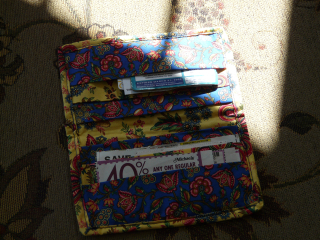 She made a coupon organizer with a pattern from JoAnn’s and posted the pattern here. It took very little time, I only used two kinds of fabric and it didn’t take long at all. I added a little interfacing to stiffen it up. Doesn’t quite look as nice as June’s but it is very useful to me because it is so light and portable! I also used her tutorial to make a seat belt sleeve. It isn’t pictured here but is made with fabric I used to make a car litter bag and sunglasses case. You can see one I made for Aidan at right using Lightning McQueen fabric. I made it too big as I made it for a wider belt as it turns out my belts are only 2” wide. So I took the Velcro off and did it again. Aidan is thrilled. 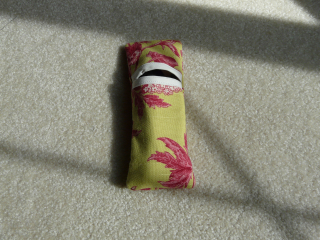 I made him a matching sunglasses case, too, but it is in the car as well. I made my own pattern for a car trash bag. I decided to make a removable liner using PUL fabric. This is what people use to make diapers – it is waterproof and I can take it out to wash it. It stays in place with snaps in the front and back. Because it isn’t so pretty where I sewed the snaps on, I made my first covered button to hide it! I also made my first buttonhole for the top to hang over my car lighter. Sometimes it is hard to sew with a 4-year-old around and two cats that love to help sew. I wouldn’t have it any other way but mistakes get made and I rush, too. 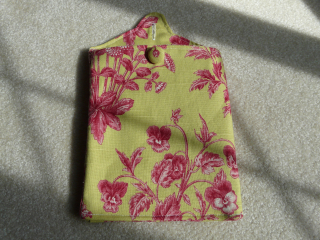 With this project, I used some medium-weight interfacing and home dec fabric. I accidentally sewed the interfacing in the wrong order and had to take out all my sewing. So that weakened the edges a bit and I had to sew over a few spots again and the bottom of the bag turned out different than I wanted and, and... Well, you get the picture. So enlarge at your own risk. 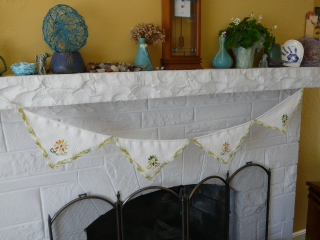 I think if I sewed one again, I could make a tutorial if anyone is interested. 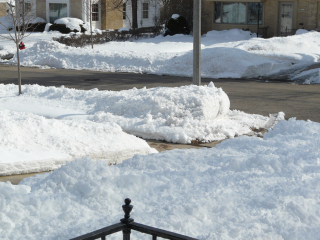 Here is the land of Cheeseheads, we celebrate St. Packer's Day. Well, not really. Actually, we might. For sure - Aidan does. He has somehow taken our talk of Brett Favre (*sniff*) and the Packers and the discussion of another holiday and morphed it into the all-time great Wisconsin holiday. I'll have to start campaigning for it. 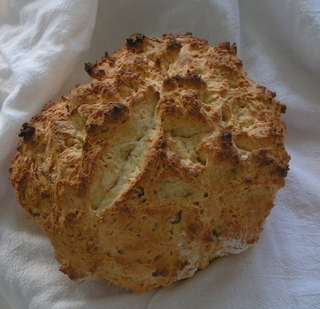 This year I will have to make bread and scones another day as we are busy getting ready to see Bruce Springsteen tonight! I can't believe this day finally came. Hooray for us. Aidan's a kid who, to borrow a phrase from a great movie, expects presents on Mother's Day. 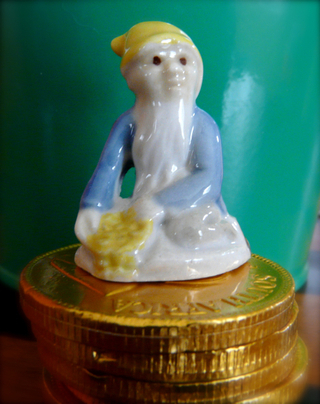 So the leprechaun threw up on our carpet to leave a trail to a pot of golden Krugerand chocolate coins and a two real presidential gold dollars to boot. A couple Pixar Cars were thrown in for good measure. Isn't this Wade leprechaun adorable? Favre, Bruce and Erin go Bragh. I knew the day would come but I didn't know this soon. I am very sad today and I'm sure it seems silly if you aren't a football fan or a Packer fan for that matter. I want to thank Brett Favre for drawing me into football in 1996 (when I finally started watching the game) and giving me joy and heartache since. 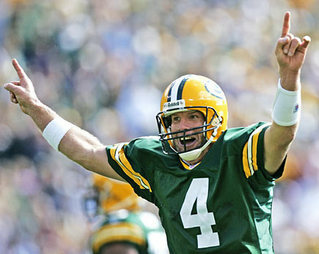 When times were rough in our home, the Packers and Brett Favre were a great diversion. His perseverance is to be admired by anyone as he has had more than his fair share of sadness. I keep hoping it isn't true and I really hope that Favre knows his fans wouldn't have wanted to quit playing before he was ready. You can read about Favre many places online. MSNBC has this article today. Update: Thank you, too, Brett for all your work with the Make-a-Wish Foundation and for your many donations to Children's Hospital of Wisconsin. As a mother of a child whose life was saved by Children's Hospital four times, I can't thank anyone enough who supports this fabulous hospital. Hope your day is smashing. 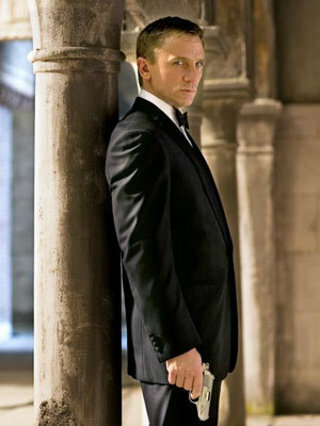 **Note: I swear to blog that I am not obsessed enough to keep up with Daniel Craig's birthday. I saw it on Dlisted. Smoking hot picture, though. I can't wait for Quantum of Solace to come out in November!